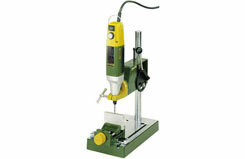 All Products > "28606 Proxxon MB 140/S Drill Stand"
The 120 x 220mm table is milled and fitted with a fence and scale. The solid column (280 x 20mm) is made of steel. The headstock is of die-cast aluminium, offering a throat capacity of 140mm and 30mm travel. A chromed feed lever operates via drive disc and ball bearing system, offering a sensitive feed set-up. Slotted guides and fits and pinch screws allow simple height adjustment as well as the fixing of the mill/units (20mm bore fitting). A depth stop as well as drilled, tapped hole for securing the MICRO compound table KT 70 and holes to fix the drill stand itself are also provided. Please Note: Image shows power tool and drill bit which are not included, but are available to purchase separatley.